Offline signature verification is the problem of authenticating individuals via images of their signatures, as extracted from bank cheques and similar documents. SIROX was designed to handle the full range of offline signature verification scenarios, including the worst-case scenario where only one sample signature is available for comparison. In many circumstances, a company only has one hard copy of each customer’s signature and wishes implement some form of automatic signature verification without requiring all the customers to attend an enrollment session. SIROX is unique in being able to facilitate this scenario. With only one master signature for comparison, SIROX is able to achieve a False Acceptance Rate of 10% for seen forgeries. In other words, 90% of genuine signatures (by the same person) are correctly accepted, whilst 90% of attempts by other people to forge the signature (with the original signature in front of them) fail. SIROX’s accuracy improves with an increasing number of master signatures in its database for comparison. 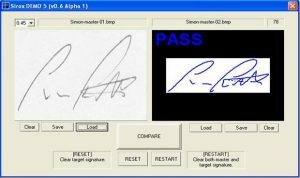 In addition, SIROX has the ability to learn how signatures vary over time making it unnecessary to capture fresh sets of master signatures every few years. Worst case – single sample signature. *Seen forgeries – forger sees the sample signature and practices signing it. *Unseen forgeries – forger knows the characters along with spaces in the signature. *Random forgeries – a random signature is entered. Automatic extraction of signatures from documents. Automatic adaptation to changes in signature over time. Support for low numbers of sample signatures. Automatic display of signer’s details (including photo) for additional verification. Full audit trail of signatures analysed (time / date signed, number of attempts, etc).